My Daily Slice of Golf...the Blog: Do they make carseats for these? Do they make carseats for these? Tiger currently drives a Bentley Continental GT. 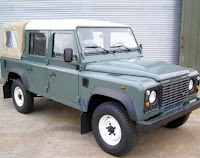 ...may I suggest a gently used Land Rover Defender?